Transform your child's room into an explorer's paradise with our Dora the Explorer wall decals. Featuring Dora (in various poses and outfits) and Boots, along with many other coordinating pieces, these RoomMates peel and stick Dora the Explorer wall stickers make creating an amazing room makeover quick and easy. Our RoomMates Dora the Explorer wall decals (also known as wall stickers or wall appliques) are repositionable, removable, re-usable, and washable... a parent's dream combination for kids' wall decorations. Whether you are transforming bedroom, playroom, or even classroom walls, our peel and stick Dora the Explorer wall stickers offer decorating ease with no damage or residue to the surface when removed. Note: © Viacom International Inc.
1.25" x 1.125" to 6.5" x 11.25"
Transform your child's room into an explorer's paradise with this Dora the Explorer peel and stick border. Inpire imagination and adventure with this Dora the Explorer & Boots peel and stick wall border. 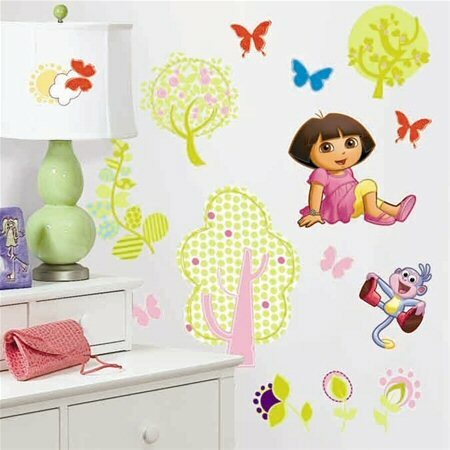 This Dora the Explorer giant wall decal set includes Dora standing in a flower patch and fun flower accents. Dora the Explorer will inpire hours of imaginative fun and adventure with this Dora the Explorer peel and stick wall border. Dora the Explorer is a friend to all and inpires hours of imaginative fun and adventure with these Dora the Explorer wall decals.